At first, I thought that this was either reverse psychology or actually a strange moment of honesty from a politician. Although, I have to say that Motlanthe has always struck me as being a fairly honest sort of bloke, which is pretty unusual for someone in that profession. Bewildered? Of course you are. So allow me to explain. Quite how two leading members of the same political party can publicly differ so much over a simple issue is beyond me. And of course, they’re both correct. 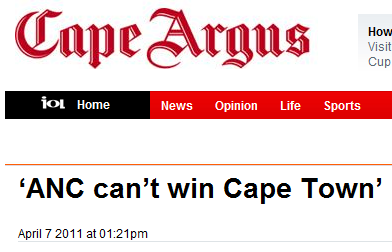 Mathematically, the ANC can win Cape Town; realistically (barring any bombshells in the next couple of weeks), they probably can’t. Does anyone actually need to be told this? Probably not. Are potential voters likely to be swayed by this sort of apparent difference of opinion? Probably only as much as they are by the overblown promises of either of the main parties in the election race. 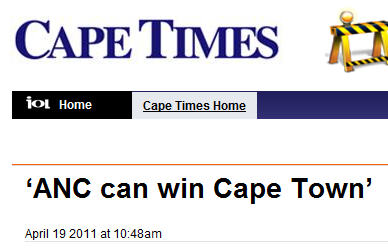 Meanwhile, if any local political organisation can come up with a plan to stop my neighbours dogs barking at 5 o’clock every single sodding morning, then they can have my vote instantly and without question, whether they think they can win in Cape Town or not. I don’t often blog about football considering how much of my time it occupies, so you’ll surely forgive me this (or, more likely, you have already stopped reading). While the world was watching the Barca players and their referee overcoming Arsenal at the Nou Camp Circus, there was huge joy and no small amount of mild relief Chez 6000 as my beloved Sheffield United ended a winless streak of 14 league games, a spell during which they have only taken 4 points from a possible 42, by beating Nottingham Florist at Beautiful DownTown Bramall Lane last night. This was obviously a great boost to the Blades, but was marred by Bafana Bafana’s Kagisho Dikgacoi scoring the winner for Crystal Palace against Cardiff, thus meaning that we made absolutely no ground on the London club whatsoever. “Local boy done good” never sounded so hollow. Rather than now suggesting that we have taken seven points from a possible forty… forty-five, I have decided to abandon the subject numbers required for statistical significance so sought after in my chosen profession and instead claim (accurately, nogal) that recently, we have taken three points from a possible three. It’s surely onward and upward from here: mainly because we can’t go back in time and we can’t go much further down at the moment and Watford must surely be quaking in their collective yellow boots as the Mighty Red and White Machine rolls into Hertfordshire for Saturday’s High Noon (Brazilian time) showdown. Vote for Joyanne and WIN! Incoming from Joyanne Goodenough over at the Portfolio Collection Travel Blog. You get – a feeling of enormous well being for helping me and the chance, as a voter, to win an iPod Nano. It really is quick and painless… and if I say so myself I think the pics are worth a vote. No worries, Joyanne. We at Chez 6000 have long been admirers of your photography, so I’m happy to help, as will our reader who does everything we tell him to. So that’s two more votes for starters. … so you hardly have to do anything at all. So let’s get Joyanne a sparkly new computer. And maybe yourself an iPod into the bargain. Author 6000Posted on June 23, 2010 June 24, 2010 Categories recommended site, this is south africaTags ipod, joyanne goodenough, win5 Comments on Vote for Joyanne and WIN! After the excitement of the Opening ceremony and the South Africa v Mexico game, you can watch the first game from Cape Town (in which France take on Uruguay) at 2030 CAT this evening. And due to the seats that I’ve been allocated, you might well see me as well. By my calculations, I should be directly (ish) behind the far corner flag at the left hand end of the field when looking from the main camera point. All you have to do is take a quick snap of your screen featuring me and my flag (hint: be ready when there’s a corner on the far left side) and email it to me using the link below. The first email I get with an appropriate picture will be the winner. Email link: click, attach, win! Otherwise – enjoy the festivities and if you are going along to any World Cup events in Cape Town or indeed South Africa – GET THERE EARLY!!!!!! Author 6000Posted on June 11, 2010 Categories this is south africaTags competition, win, world cup 20101 Comment on See me and win!